We rejoice in the life and legacy of Shirley Ann Farrell, who went to be with the Lord at the age of 82. She was born and raised in Ellsworth, Michigan by her parents, Maynard and Pearl Alward. Shirley was a devoted wife for 66 years of marriage, a caring mother to three children and their spouses, a grandmother to eight, and a great-grandmother to seven. Shirley married her high school sweetheart, Chester Farrell, on December 22, 1952. Early in their marriage, when their daughter Sheila was just 2 years old, Shirley drove across the United States and settled in Washington state to be with Chester as he served our country from 1955-1957. Upon finishing his service, together, Shirley and Chester launched their real estate and hospitality careers. Shirley started off waitressing at the Shanty Creek Resort while Chester worked at Morweld's Steel Company. From there, they opened the Farrells’ Resort in Ellsworth and then grew to own and operate the Villa Moderne Motel in Charlevoix. Their strong relationship and work ethic helped them build a business from the ground up, a value she passed onto her children. Shirley and Chester spent 34 years traveling each winter to Florida including many other adventures from Paris to Hawaii, and all across the United States in their RV. 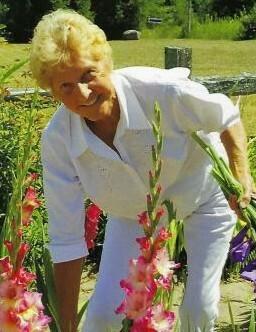 You never saw Shirley without a handful of gladiolus in the summer (and if not gladiolus, cinnamon rolls)! She loved her garden, and their 120 acre farm property where they retired and called home. One of her many secret talents was writing heartfelt poems for those she loved. Shirley was an extraordinary example of faith and love to her children; Sheila, Brian and Glenda. The dinner table was a sacred place where she would welcome her family and those in need every Sunday after church. She was steadfast in prayer and generosity to all she held dear. She is preceded in death by her parents, Maynard and Pearl Alward; her brothers, Bill and Jerry Alward; her sister, Donna Heeres and her son; Charles Farrell. She is survived by her husband, Chester Farrell; daughter Sheila (Mark) Essenberg; son Brian (Cindy) Farrell; daughter Glenda (Jeff) Wilhelm; her grandchildren, Sara, Marie, Elly, Anthony, Austin, Abby, Grace and Anna; her great grandchildren, Molly, Max, Jadon, Parker, Gibson, Ximena and Eric; her sisters, Polly Strange, Betty Alward and brother, Ray Alward. Visitation will take place at 3:00 p.m. Sunday, April 14 at Eastport Baptist Church followed by a service celebrating her life at 4:00 p.m. Following the service, all are welcome around Shirley’s favorite place, the dinner table. Memorial contributions may be given to First Friday Praise and Worship c/o Eastport Baptist Church, PO BOX 2, Eastport, MI 49627 or Community Recovery Alliance, 1180 Winnell Court, Petoskey, MI 49770.. Arrangements have been handled by the Ellsworth Chapel of Mortensen Funeral Homes. Please sign her online guestbook www.mortensenfuneralhomes.com.